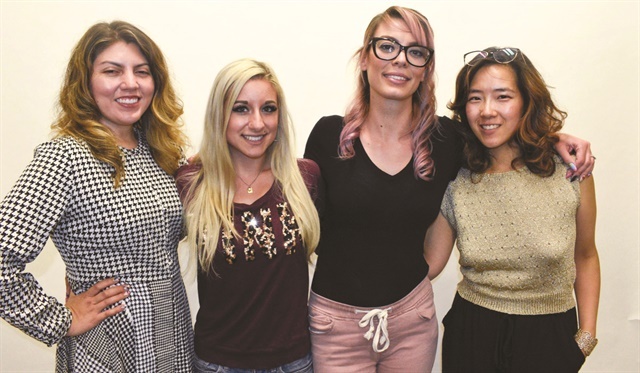 NAILS executive editor Beth Livesay, model Ciara Pisa, Deanna Stelmaschuk, and art director Yuiko Sugino. Deanna Stelmaschuk has been a nail artist for four years in the rural area of Fairview, Alberta, Canada. 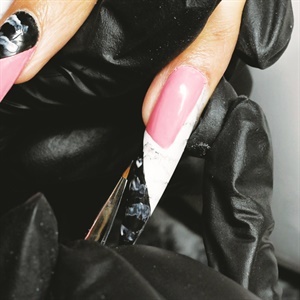 She found it difficult to get exposure for her work as a nail artist in such a remote location, so she entered NAILS Next Top Nail Artist competition. She placed fifth in Season 4 and currently serves as a judge for Season 6. “The competition really helped me to gain exposure and challenge myself by creating things I didn’t think were possible for me to create,” says Stelmaschuk. 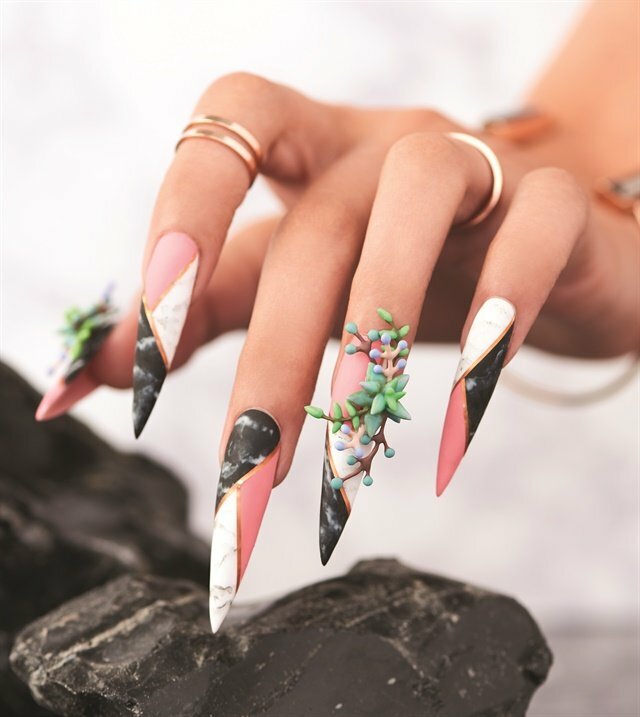 She currently serves as an ambassador for En Vogue, and came up with this on-trend marble and succulent design. See more of her work @deannastelmaschuk. 1. Prep the nails and apply a layer of En Vogue Super Bond, then Connector, and cure. Affix forms and sculpt the nail with En Vogue Rosé Modeling Resin and cure. 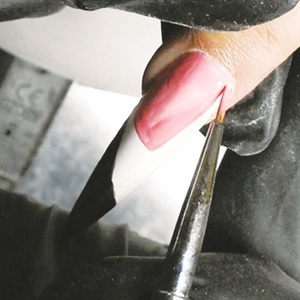 Shape the nails with a 100/180-grit hand file. 2. Wipe the nails with alcohol and begin color blocking. Start at the cuticle and work downward, flash curing after each section. Colors used: En Vogue Flamingo Simply Color, Black Lac It!, and White Lac It! Cure and wipe with alcohol. 3. Use Simply Color Black to draw thin lines on the white and smudge them with alcohol. Cure. Apply a layer of Fiber Gel to seal the marbling, cure, and wipe the dispersion layer. Repeat on the black, creating marble lines with En Vogue Ultra White. 4. Apply rose gold striping tape over the color blocked lines. Add another layer of Fiber Gel, cure, and wipe. Top the nails with En Vogue Matte top coat. Glue on succulents.